The following products are being made available to provide you an opportunity to have a piece of Bryan memorablia and to encourage donations to the Bryan V. Kerchal Memorial Fund, Inc. 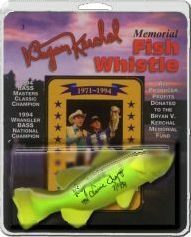 Donate $5.00 to receive the Bryan Kerchal Memorial Fish Whistle. It comes packaged with one trading card. Package size - Approximately 5 x 7 inches in width. 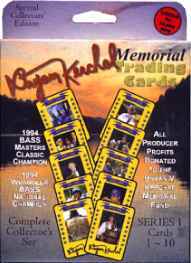 Donate $4.00 to receive Bryan Kerchal Memorial Collector’s Pin – perfect for tournament vests or your favorite fishing hat. Approximately 1 & 1/8 inch in width. 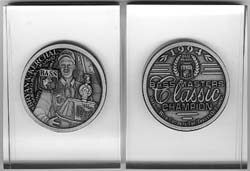 Donate $20.00 to receive the Bryan Kerchal Memorial Medallion, encased in Lucite. The medallion is two inches in diameter and the Lucite block is 3 & ¾ inches high. If you are making a donation and desire a product(s), please be specific about which product(s) is desired.